Public transportation is an integral asset in the Matute Family Car-Lite Tool Kit. We live near several bus routes with frequent service, which also happen to serve major destinations in our area. Put another way, we ride buses a lot, and we can do this because out in our corner of Los Angeles, we’re blessed with good transit geography. Broadly speaking, good transit geography is any geography in which good transit destinations are on a direct path between other good transit destinations. (Especially, destinations that are on the way). Some good transit ‘destinations’ revolve around basic needs: affordable grocery stores, medical care, a bank, and a post office. In our situation, there’s a Trader Joe’s along the bus route between my husband’s job and our house. The route has very frequent service, so it’s actually not a big deal for him to pop in to grab some items on his way home. In our world, good transit geography also includes living very close to bus stops. As noted by Child in the City, a European nonprofit which promotes and advocates for the rights and needs of children living in urban environments, transit service can be a make-or-break based on the location of the closest stop. They correctly point out: When you are pushing a stroller and carrying 3 bags, the extra block or crossing seems ten times further. TRUTH! Another example of “good transit geography” is access to jobs. Ideally, these would include jobs that you are personally qualified for and willing to take. Because you guys, the spatial mismatch between jobs and housing in major regions like LA is real. The barriers to closing the gap are innumerable. GREAT transit geography hits the Housing/Transit/Education (HTE) nexus sweet spot: frequent transit service, affordable housing, and high quality early childhood centers and schools. This combination is exceedingly rare in most US cities, including Los Angeles. UC Berkeley Center for City + Schools’s “Connecting Housing + Transportation + Education to Expand Opportunity” report. Santa Monica is wonderful and special in many ways. By living here, we zone to exceptional public schools. Wilshire will be able to take the bus to Samohi, a nationally ranked public high school served by 8 bus routes and the terminus for the Metro Expo line. But a few words about how quickly things can turn on a dime, even for families the most determined to stay car-lite, and have made choices we hope would support that decision. We are fortunate to live within walking distance or a short bus ride from high-quality daycare and preschool programs. But unlike with the local elementary school, there’s no guarantee that you will get in. That’s the situation we’re in with the preschool closest to our house. It’s great! But the entry point is the toddler room – and I passed on enrolling Wilshire due to cost and the difficulty of commuting there on public transportation or with a bike. So, we’ve applied to another preschool not quite on the radar of people we know from college. It’s not fancy. It’s not NAEYC-accredited. But it’s along the way to my husband’s job, and on the bus route with frequent service. (See the theme?) And we feel very good about this school. But what if neither of these programs pan out? Well, there is a plan C. It’s in our price range. But it’s not along the way. We’ll discuss how we’ll manage that in another blog post if it comes to it, because I am honestly not sure. 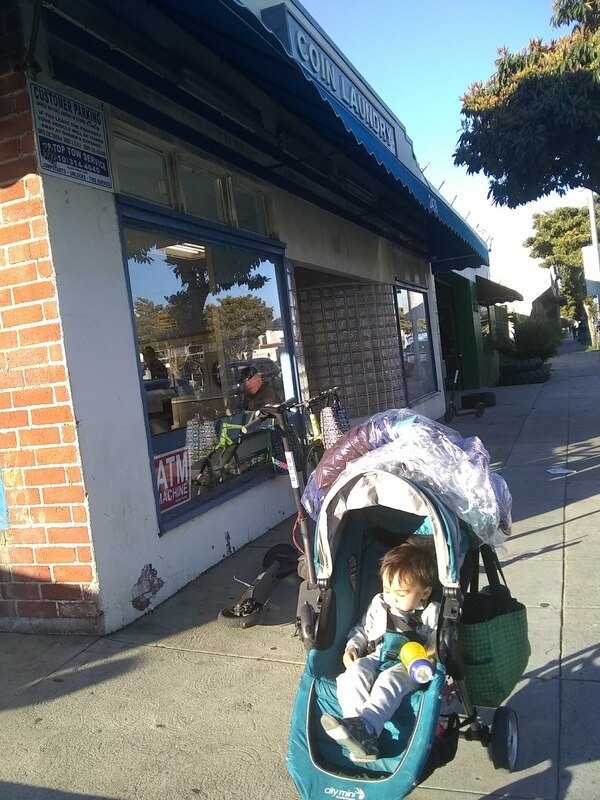 On our way back from the dry cleaner; I draped our nearly cleaned clothes over Wilshire’s stroller. 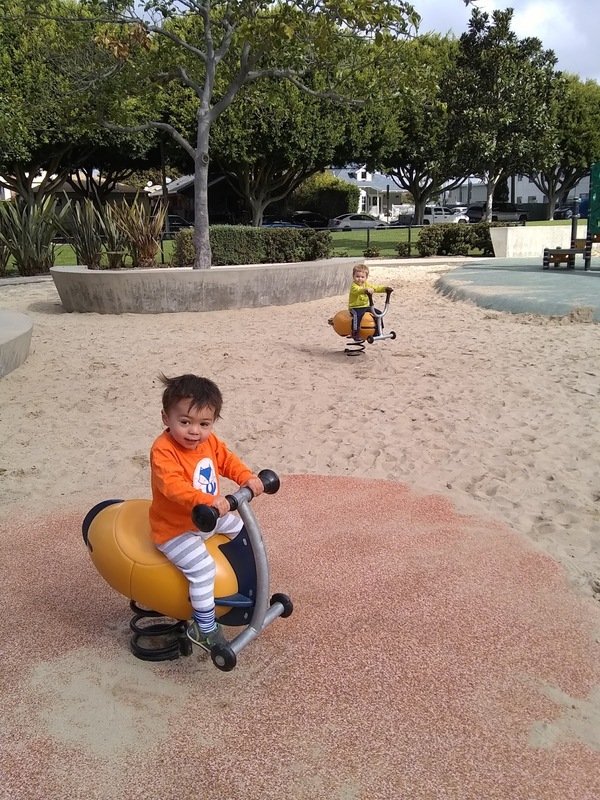 When I first reflected on how we have gotten by as a one-car family for so long, I originally thought I would be writing about Wilshire’s bike seat, or the wagon we bought off Amazon to haul around boxes and groceries. Or, perhaps, I’d talk about how found high-quality childcare close by. We live in close proximity to the goods and services which we cannot substitute through online shopping. THIS is the way to do the concert: Blanket, wagon, folding side table, wicker suitcase for all your outdoor picnicking needs. Every Sunday evening in August, the City of Santa Monica holds a free jazz concert in Gandara Park. It’s free, it’s chill, and it works exceptionally well for multi-generational families. 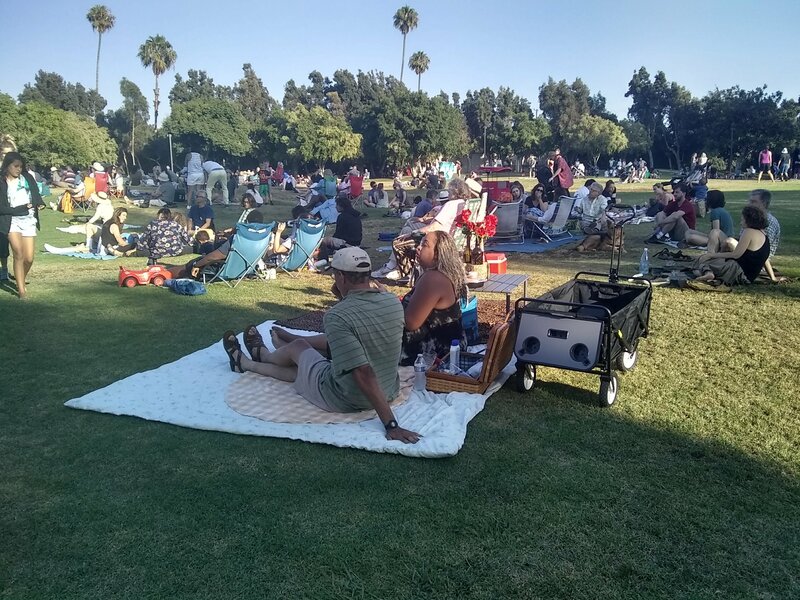 Lets’ start with the obvious: I am a major fan of Jazz on the Lawn, this concert series organized by the City of Santa Monica each Sunday in the month of August. The concert series started 13 years ago at the behest of a councilmember who was looking to activate Stewart Street Park, a park that used to be a dump. I started going four years ago, when I moved within walking distance of Stewart Street Park (now Gandara Park). I now plan my August weekends around these, and schedule my out-of-neighborhood excursions so I will be home in time for the concert. Juan and I both had on our light up vests coincidentally. Yesterday, I had to take Wilshire to the emergency room for stitches. 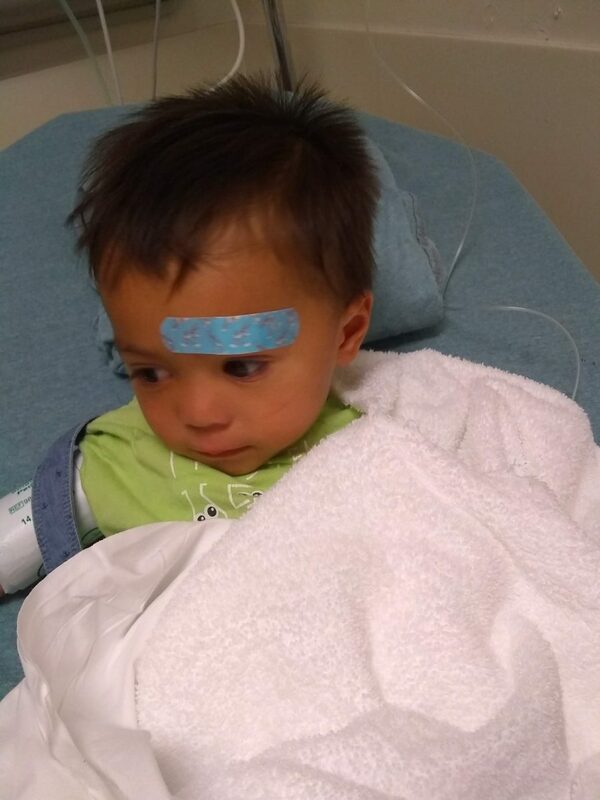 The kid tripped and hit his eyebrow on a door at his daycare while racing to get to the potty. (We’d trained him the weekend before, so he was still a novice.) Wilshire’s battle scar was a superficial cut about a half-inch long right over his eyebrow that necessitated four stitches. As many readers know, we only own one car. This means that we have all sorts of unwritten contingency plans on how we’d cope when we need to get somewhere quickly without a car. The situation gets thornier when there is a sick child, an unplanned doctor’s visit, and the parent who has to retrieve the child “green commuted” to work. 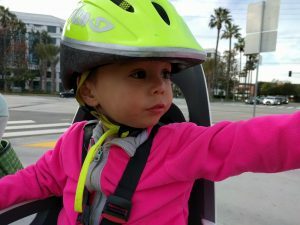 It has been much easier to remain a one-car family in our area thanks to Lyft, Uber, bikeshare, and (most recently) dockless scooter-share. But as I’d covered in a prior blog post, those three options do not work when you have to transport another human or a lot of stuff. This is a part of the “SaMo Parenting Guide”, an ongoing series where I talk about where I buy stuff for Wilshire. I know that we lost our Barnes & Noble earlier this year. But don’t fret. 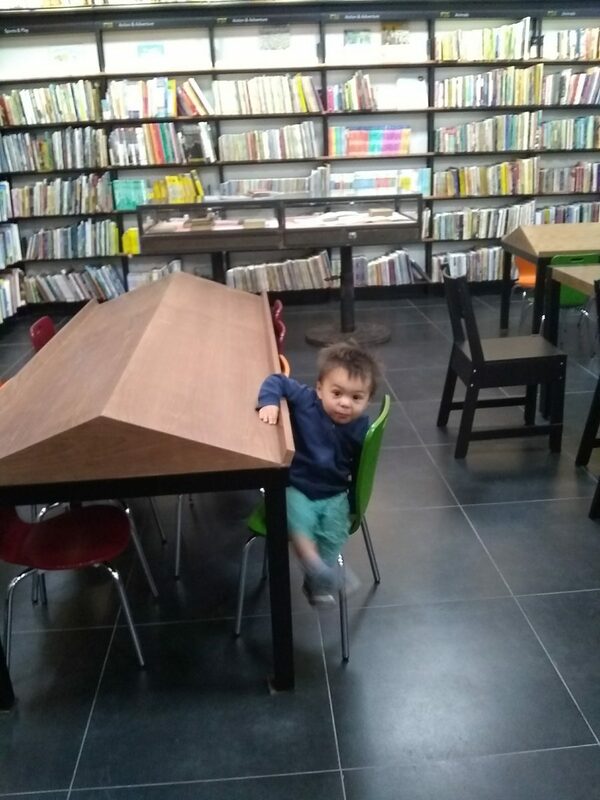 There are still several bookstores in within Santa Monica city limits that you can visit to pick out books for the young children in your lives. I have several favorites. I’m going to let you in on a secret: Most of my kid’s clothes are secondhand. Some are hand-me-downs. The rest are from yard sales and clothing swaps in Santa Monica. Time is of the essence when doing stuff like this (clothing procurement). Let me save you time with these pointers. From the Mt. Olive sale in 2016. Every fall, the preschool at Mt. Olive Lutheran Church hosts an epic rummage sale in their auditorium. The doors open at 8am. Come armed with an IKEA bag or two so you can carry your finds. This is how I managed to stock up on enough clothes to get through the year. The Mt. 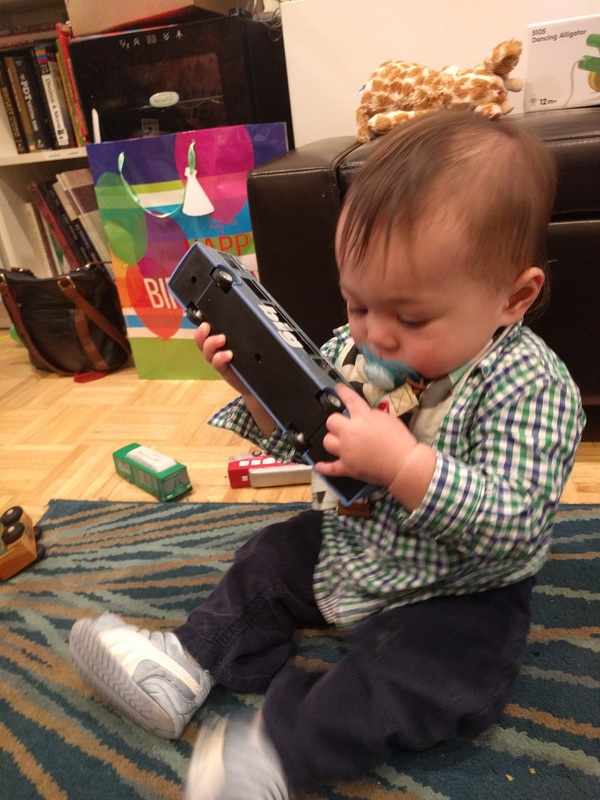 Olive sale is the best place to score toys, clothes, shoes, kitchen knick knacks, and more. Note, there is a separate multi-family yard sale in the spring (typically late April) at Mt. Olive. I have not been able to attend either. Mt. Olive Lutheran Preschool is served by Big Blue Bus Route 8. 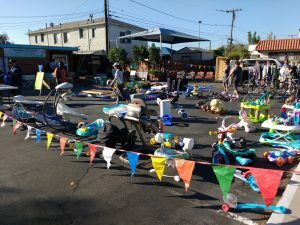 Every September, the City of Santa Monica’s Resource Recovery and Recycling division (known internally at the City as R3) organizes a city-wide yard sale. The City helps households people publicize sales through their website, email marketing lists, and ads in the local newspaper. They also make an interactive map available that allows you to hone in on locations selling things you might be interested in, such as kid stuff. Hanging out at a yard sale on an early Saturday morning. What’s so great about this is the incredible number of participants in our 8.8 square miles. You’re likely to find at least half a dozen sales to visit within walking distance. The 2018 sale will be on September 15th. You’ve been given advanced notice! Transportation: If you cannot get to the sale on foot, then it’s not really worth going to. This hot pink jacket belonged to another Santa Monica toddler before I found it at a clothing swap last fall. Periodically, the Santa Monica Mom’s Club will host a clothing swap at a park in Santa Monica. You bring toys, baby doodads, and clothing your children have outgrown in a bag. They lay out tarps where you can sort your clothes by size. You then fill your bag with clothes in the next size up. That’s how I managed to find some play clothes for Will, plus this really terrific hot pink fleece jacket. If you are a stay-at-home or part-time employed mom, you can join the chapter’s Facebook group. For the rest of us, follow me on Twitter! 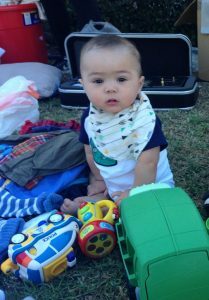 I try to find as much clothing as possible for my son secondhand because of cost and environmental considerations. I’m also a fan of buying my son clothes in person because more often than not, I’ve made mistakes with sizing when buying online – and it’s way more of a hassle, for me, to return something than to go where I can buy the clothing in person. The local shopping mall in Santa Monica is populated mostly by high-end stores, but there are two destinations for children. One is the Disney Store (I refuse to go inside). The other is Gymboree. Gymboree filed for bankruptcy in 2017 and closed hundreds of stores, but the one in Santa Monica Place still marches on. Gymboree is served by Big Blue Bus routes 1, 2, 3, R3, 5, 7, R7, 9, R10, and 18. Both carry items like toys, toddler’s kitchenware (think: Nuby and Phillips Avent bottles; Munchkin sippy cups; pacifiers; kid-sized plates and dishes, bibs), and lots of books. The prices are always a few dollars off what you would pay on Amazon. As is the case with all off-price retail, the fun in shopping at these places is the element of surprise in bargain hunting. But don’t be surprised if you go there looking for something very specific, and it’s not there. TJ Maxx on Arizona Ave. at 4th Street: Served by all Big Blue Bus routes coming into downtown Santa Monica; Metro 704 and 720; Metro Expo Line. Not cheap – but also, totally worth the money for items that will get heavy use, like coats and play clothes. There is one within walking distance of my house, on Wilshire Blvd. and 20th Street. The Gap on Wilshire at 20th St is served by Big Blue Bus Routes 2, 41, and 42. Costco. They carry Carter’s and Little Me, brands that are both well-regarded by Baby Bargains. I picked up a set of pajamas for Wilshire last weekend for about $10. Carter’s. Their clothes are well-made and withstand the wear-and-tear of an active toddler. The closest Carter’s to Santa Monica is on Sepulveda Blvd. in Culver City. There is also a Carter’s now open inside Crenshaw Plaza, which is about a 10 minute walk from the Crenshaw Expo station. We’re also committed to staying because I think Santa Monica is going to be a great place for us to raise a family. You know how some people say they want to do better by their kids? Providing any future kids of mine with the best education I can is so important to me. And so is providing my (future) kids with mobility independence. I think that both are feasible by living in Santa Monica. Because of the city’s walkability, bike infrastructure and transit grid, I’m optimistic that any kids of mine will be able to get from school to third places like the Boys & Girls Club or the YMCA or back home on their own. Before anyone says that I’m already intending to be a reckless parent, my husband and I came of age in the suburbs. He was given keys to a car when he turned 16. I walked the Last Mile home because it was faster than waiting for a bus on 60 minute headways. I felt really badly about being so dependent on my parents for my transportation needs as a teenager. The greater Los Angeles metropolitan area is one of the most diverse, poorest, and segregated in the country. The neighborhood I grew up in was poor and predominantly minority immigrants; our retail was all neighborhood-serving and it was looted and/or burned during the 1992 Riots. I got to ride my bike on the street but as long as I came in before dark because of gang activity. There is considerable wealth and privilege today here in Santa Monica and on the Westside in general. In contrast, my parents now live in an inner-ring suburban neighborhood adjacent to a light industrial zone with vast income inequalities. They made sacrifices that I would have tried to stop had I known better (which is kind of nuts given that I was a kid at the time). I’m convinced that the doubling (Dad) or quadrupling (Mom) of their commutes has taken years off their lives. At Palisades Park the day after Christmas in 2013. Welcome to my new blog. I’ve decided to call it Raising Wilshire. My hope is to start first with writing about my experience as a working mother raising a family in an urban setting, and to go from there. I am also looking forward to writing about topics like child care (why it’s so hard to find and expensive), school choice, and raising a son to be kind, respectful of women, and emphatic. The kids and I really should have walked. Or biked. But we (the moms) didn’t think we could get to our destinations safely – and we were trip-chaining under time constraints. Transportation scholars would tell you our line of decisions are common amongst moms everywhere. Wilshire had a busy Saturday morning. 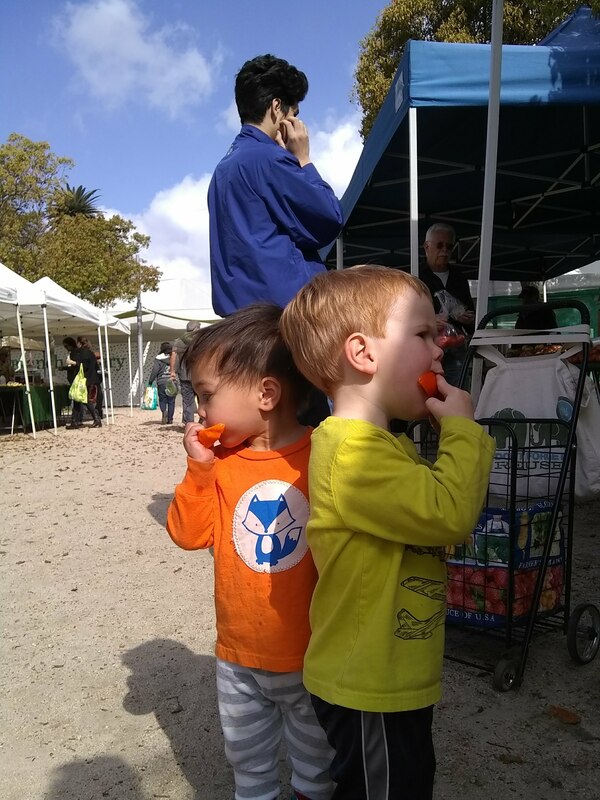 He got to go together with his neighborfriend to Virginia Avenue Park, where they also host a weekly farmers’ market, and then to the pool for his first swim lesson of the year. 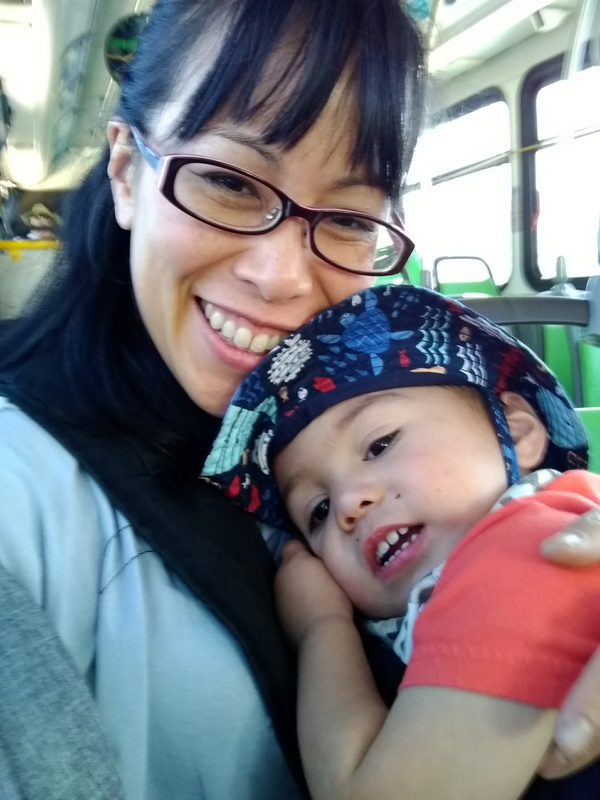 All of this was made convenient because my car seat (a Chicco NextFit) is easy to install–so we only had to take one car–and because there was free parking at our two destinations (the park and the pool). We really should have walked. Or biked. Virginia Avenue Park may have free parking for cars, but they’ll valet your bike! I was with a friend who is very comfortable riding a bike; she is the yin to my yang. The park was about a mile away. The pool was six blocks east of the park. The bus was off the table, even though I can ride for free, because the two routes that go between my house, the park, and the pool don’t run on weekends. I’ve walked to this park before. It necessitates walking along Cloverfield Boulevard, a fast-moving north/south street between my house and the park, and crossing the on- and off-ramps for the I-10 freeway. I worry about not being seen by motorists entering and exiting the freeway. It’s not an irrational concern. 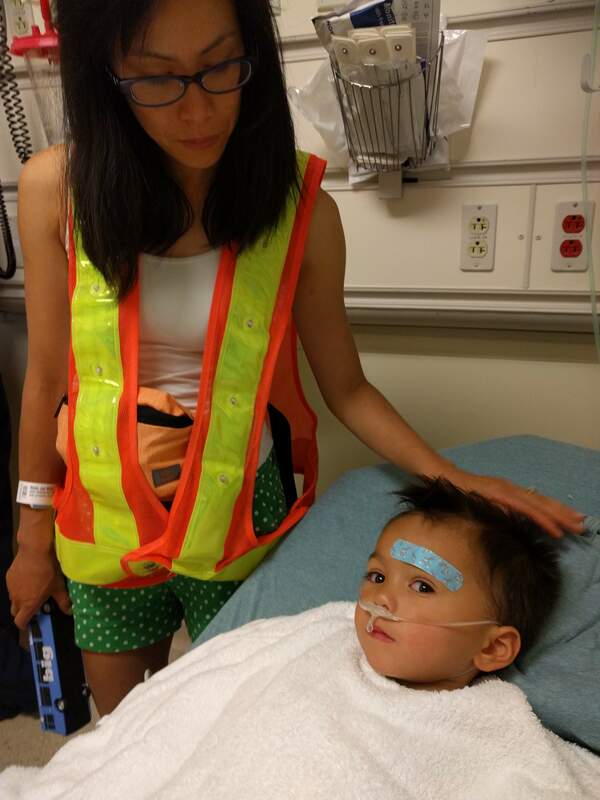 Last year in Santa Monica (2017), 8 pedestrians died last year – and this doesn’t even reflect the close calls I experience, and they are numerous because I still walk with my son every day. I cannot even begin to fathom riding my bicycle on Cloverfield Boulevard with my child. Not yet. Not right now. Not until that street design changes. And I am hopeful that it will change, but I can’t tell you when. My choice, like so many of women’s travel choices, was based primarily on safety. 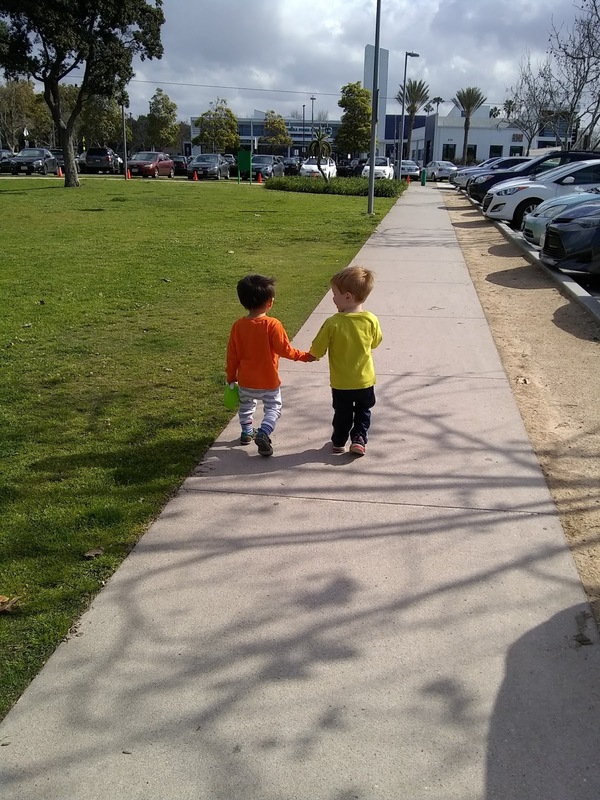 I was confident the kids could walk that far, and I knew it would be the healthier and more interesting choice for all of us–but without good walkability, I wasn’t sure that I could keep them all safe. All across the country women, in particular mothers, make similar choices every day. Poor street design, disparate land use, time constraints, lack of personal safety—all of these conspire to force women off their feet and into cars. We have built a transportation system that discounts women’s travel needs, and women—and our communities—are suffering for it. Alright, enough of the serious talk. Below are pics of the kids. 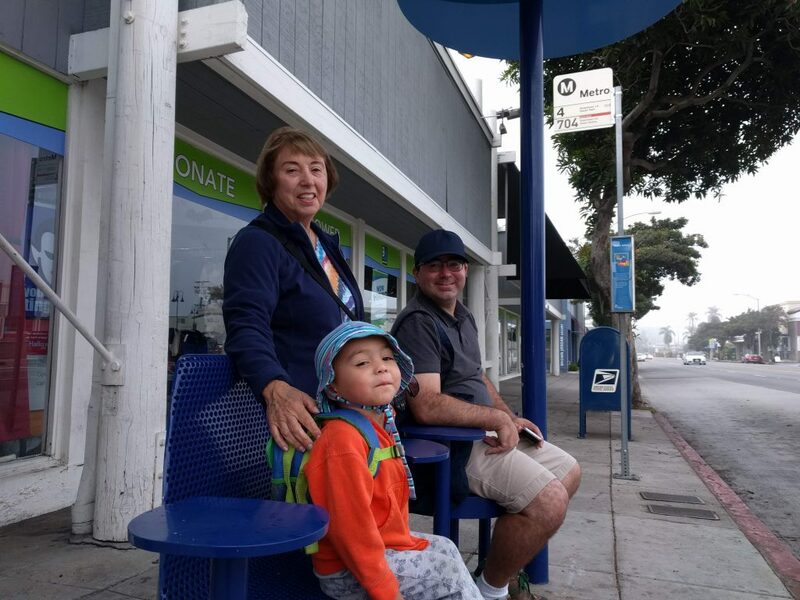 A few weeks ago, a group of residents in Santa Monica officially launched a petition drive to solicit enough signatures to put a measure to institute term limits for our city council. (There are no term limits presently in Santa Monica. LA limits councilmembers to 12 years.) While I have no position on the issue, I did find it reassuring that I also recognized the woman soliciting signatures. Even if I do not agree with her most of the time, she is part of my community and I am part of hers.